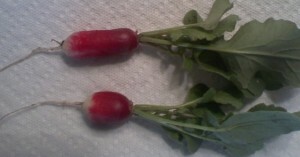 More radishes. Still a little small, but still tasty. I have a bunch more that will be ready soon. After I ate the first one, I planted a bunch more by sticking seeds in the various nooks and crannies that will be (mostly) vacant until later in the summer.